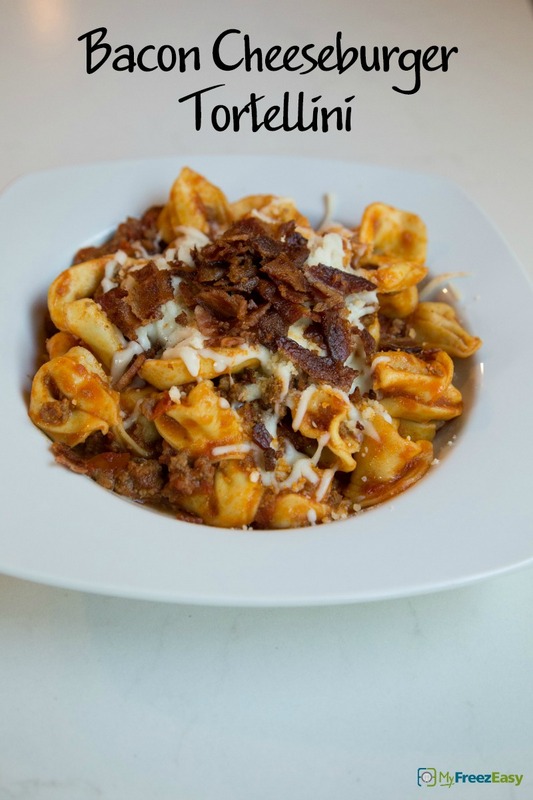 Delicious cheesy beef and tortellini nestled in a creamy tomato sauce, with a hint of bacon cheeseburger flavors! If needed, cook the bacon and crumble. Stir in the crushed tomatoes, red wine vinegar, yellow mustard, tortellini, beef stock, salt and pepper. Bring to bubbling, cover and cook about 10 minutes, or until tortellini is cooked. Then stir in the cream and sprinkle the cheeses and crumbed bacon over the top. Cook over low heat another few minutes, until cheeses have melted. Serve Bacon Cheeseburger Tortellini Skillet with veggies. Put baggie in the freezer and freeze up to 6 months in fridge freezer or 12 months in a deep freezer. Thaw in the fridge overnight, or a warm bowl of water for about 20 minutes. Transfer to skillet and cook the pasta and sauce. 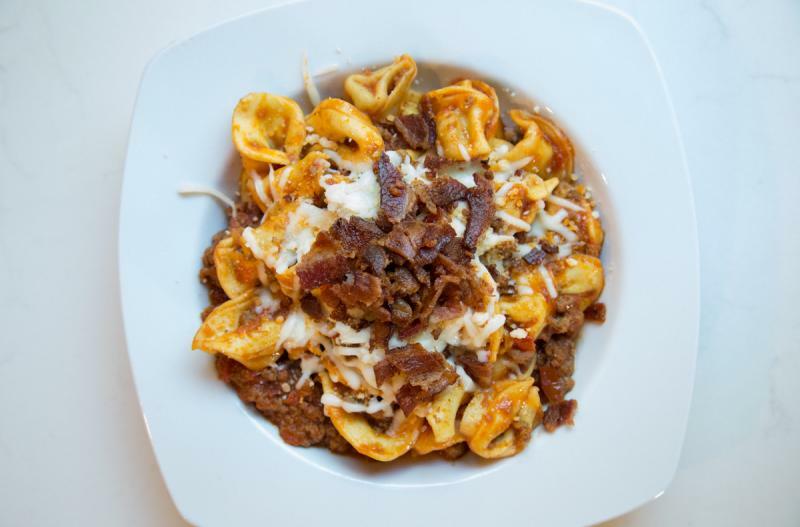 Once the tortellini is cooked, stir in the cream and top with shredded mozzarella cheese, Parmesan cheese, bacon crumbles, and cook until cheese melts. Use your preferred variety of tortellini. If cooking from frozen, you might need to add 5 minutes to the cooking time. Thaw completely and cook the pasta and sauce in skillet. Once tortellini are cooked, stir in the cream and top with shredded mozzarella cheese, Parmesan cheese, bacon, and cook until cheese melts.